Prevention is the best medicine (after penicillin, that is). Presumably you're at this website because you already have a rat problem, but did you know that the below preventative techniques are essential to you solving your existing rat problem? Plus, you'll have no more rodent issues in the future. Yay! Let's get started. I guess the first thing that I'll say is that there's no way to keep rats from existing - that is, there's always going to be rats living outside. If you live in an urban or suburban area, you'll have rats. That's just the way it is. Where there's humans, there's rats. They easily find a way to survive. So really, what I'm talking about here is preventing rats from getting in your house, or attic, walls, crawl space, basement, commercial building, etc. In the above photo, you can see several types of entry points rats can use to enter a house. In a couple of the cases, rats have chewed open the entry holes. If areas such as these are sealed shut with reinforced steel screen, then rats can't chew their way in. Eliminate debris such as garbage or compost piles on the property. Seal all gaps, with steel, leading anywhere into the house. Don't leave out pet food or open garbage cans. Bird feeders can attract rats, as can fruit trees. A pet cat or two might help. But I have seen rat infestations in homes with cats. Planting or spreading mint leaves - that's a myth. Use of rat repellants such as ammonia, mothballs, or cat urine. Use of ultrasonic sound emitters (proven fraudulent by the FTC). FIND OUT HOW THEY ARE GETTING IN! - SEAL ALL ENTRY POINTS! Okay, this is the most important prevention concept: don't let them get into the house in the first place. We don't mind so much if the rats are outside, doing their thing, minding their own business in the dark hours of the night, but when it comes to getting inside our houses, scurrying up the walls, pooping in the attic, raiding the pantry and contaminating our homes, that's where we draw the line. So prevent that from happening! Seal up all the entry holes. 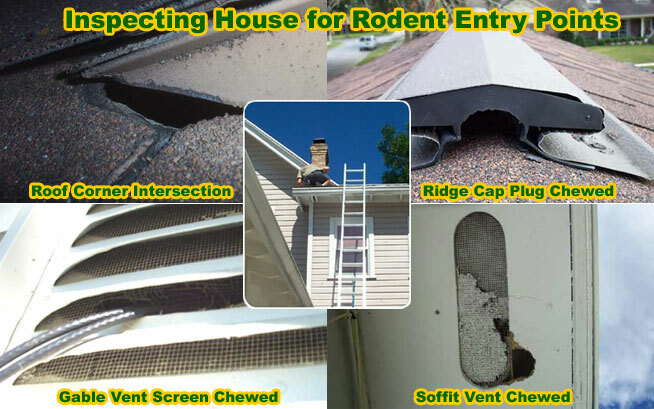 There are dozens of areas rats can use to get in: vents, eaves, roof joints, plumbing stacks, AC chases, the chimney, soffit vents, loose siding, pipe outlets, etc. Any hole the size of a quarter will do. In the below photograph, there's an insulated pipe leading outside and up the wall. It goes right into the walls of the home and up into the attic. Talk about easy for the rats! Holes like this one are a rat magnet. They should be sealed at once. I seal entry points like these by bolting in steel mesh or metal (such as aluminum) flashing. I then use a polyurethane sealant to stop the air flow - that's important, because rats detect air flow, and if they can smell a gap open on the other side of a hole, they work hard, they chew, to get their way in. I seal up all vents with steel screen. As stated earlier, if you have a current rat problem, and need to solve it, outside of just prevention, you need to do these home repairs to keep rodents out. Otherwise, rats will just keep coming and going into your house, and you'll never solve your current rat problem. So get cracking on those preventative repairs! If you don't have a good understanding of rat behavior, if you don't have a good understanding of building architecture, if you lack the tools to fix the home, the ladders to reach all the roof openings, the safety equipment and know-how, then I do definitely advise that you hire a professional to do a complete preventative rat-proofing of your house. WILL A CAT OR DOG HELP? Cats are superior to dogs when it comes to catching rats. But even several pet cats that are skilled hunters will not guarantee to solve a problem with rats in your house. I have been to many rat jobs at households that have many cats, and outdoor cats. Rats are very good survivors, and when they have a house to live in, cats and dogs can't solve the problem. Read more about can dogs keep rats away. Although I wrote this site with rats in mind, such as the Roof Rat and Norway Rat, the same principles apply to other rodents, such as the house mouse. Mice behave very similarly to rats, they're just smaller. Email me if you have any questions about how to prevent a mouse from getting in your house, mouse prevention, how to prevent mice in your attic or walls, or any rodent prevention matters.